Let’s face it being able to converse in a second language is pretty cool. It is also hugely practical when travelling and a great selling point on your CV. But is that it? Well actually… research has revealed that the impact on the brain is the most fascinating part. It has been proven to boost overall mental agility, creative thought and problem-solving skills. Furthermore, what about the simple fact of teaching your child that there is a big wide world out there? That there are different cultures to uncover and adventures to be had?! “The critical period”. There is some evidence to support the idea of there being a ‘critical period’ between age 0 and 7 when the developing brain is more plastic and able to process additional languages. I would say there is truth in this but that you can start a language at any age. For me, the main driver for starting early is to ensure a positive relationship with language learning from the outset. Spark their curiosity for languages now and you will be amazed how they grasp opportunities to build on this foundation in the future. Starting a language in the early years gives children a head-start before school (where language tuition is still relatively patchy). Let’s face it we are all ambitious for our children’s futures. But mostly, it is quite frankly amazing to see. It never fails to bowl me over when a two or three-year-old of monolingual parents sings a French song to me or follows instructions in French after only a few weeks of learning a new language. Let’s bust a couple of myths, shall we? The human brain was potentially never meant to be monolingual. In fact, it can easily process several languages at once. Bilingual children sometimes mix languages which is actually positive as it shows that the brain is able to flexibly flick from one to the next. Like a cerebral work out. Similarly, to the above, starting a second language will not impede the development of the mother tongue. Studies actually show that it increases overall communication and boosts brain development. How on earth do I begin teaching my toddler or preschooler the foundations of a new language? 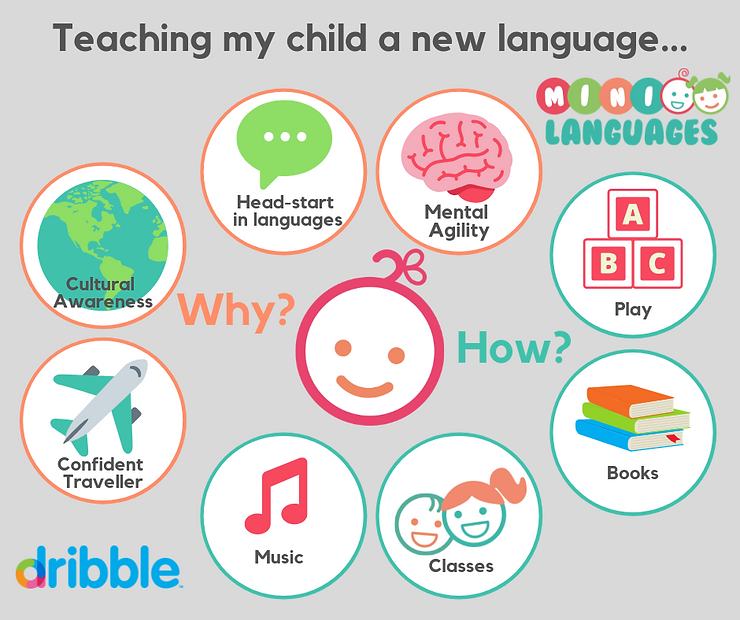 Whether you are thinking, “I was never good at languages” or “I am pretty good at languages, but how do you talk to a toddler?” there IS a way for you to start today. What is important is making it fun and manageable. I can recommend a step-by-step approach which you can easily adapt to your own routine. You will see results quickly – and you will have fun whilst giving your brain a work-out. There is always at least one time in the day when you have one-on-one time (or one on two, one on three for larger families). Getting dressed in the morning? Use this one-on-one time to introduce a song. If you can find a song which matches up with the activity you are currently undertaking, i.e. a water related song while you are in the bath, then even better! At class this is exactly how we get started. We learn a series of carefully selected songs then build on the learning with toys and interaction with an experienced teacher. Build this into your routine and you will both learn all the words in those songs! Effortlessly. STEP 3: Once you have established these songs into your routine and feel like you are learning them. Take it further. Play restaurants together– role play can be incredibly effective – and fun! Find all the vocabulary you need in this link. Do the Mini French challenge– you’ll learn so much with quick daily activities free to your inbox. Simple steps, when made fun will have lasting effects! Remember the goal at this age is to pique their interest and demystify languages. By the time they start formal education they will be miles ahead and you have given them a positive experience showing them that languages are part of life and fun! If you are looking for support in a fun welcoming environment where you will see results quickly, join us at Mini French or Mini Spanish. 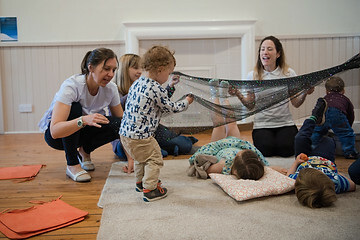 Classes are Edinburgh for age 0 to 8. Or ask your nursery to get in touch with us to start classes there. In this infographic series, I will provide fun and useful words for speaking to your child. I have always disliked the term ‘baby brain’ (I have also heard it be called ‘momnesia’). New parents have so much on their plate, of course, their focus is elsewhere! However, there is scientific backing to suggest that mothers are impacted by a lack of concentration and focus. It is true that as a new parent you can feel like your brain is not functioning correctly. You could even be forgiven for thinking that you were losing brain cells in those first crazy years of parenthood. We just focus on this new arrival who turns into a testing toddler and then an active preschooler… It passes in a flash and we can forget to embrace it. But what about #selfcare? How about using your time with your child to learn and grow WITH them? Why keep learning as an adult? We create new neural connections in our brain when we learn and practise something new. These neural connections enable our brains to process information more quickly and keep our minds sharp. Additionally, studies show that those who continue ‘exercising’ their brain in adulthood reduce their risk of, or delay, certain types of dementia. So, when you find yourself in charge of a little one and the day is stretched before you, see it as an opportunity. There are LOADS of activities you can get up to with your young child to keep your mind active. Podcasts – Parenting is a funny thing. At times you don’t have a second for yourself. Then sometimes you suddenly find yourself in need of entertainment i.e. baby falls asleep on you or toddler falls asleep in the car just as you arrive at the supermarket – potentially wasted time! Not if you have a back up of podcasts to listen to! Download several to your phone on a subject which is new to you and sit back, listen and learn. Two of my fave are TED Radio Hour and Stuff You Should Know (SYSK) but you can find literally thousands of awesome quality podcasts. Not sure how to download a Podcast? Read this article. Free online university classes – These days we have access to a world of knowledge at our fingertips, literally. In recent years, there has been a rise in access to quality learning-programmes online – for free! For online courses created by universities, check out Future Learn. You can browse their enormous catalogue of subjects, enrol and learn: any time any place. Yoga – It is quite obvious that any regular exercise has physical health benefits. Most people are also aware of yoga’s positive impact on our sense of wellbeing but did you know about its brain age-defying properties? A recent study has shown a link between regular yoga sessions and a higher number of brain cells! The good news is that you can easily start yoga with your child and many groups out there can support you. In the Edinburgh area, check out YogaBellies parent & child classes where you will get a warm welcome from Jen, Louise or Rosy. Museums – Not on your list midweek? Think again! Museums these days are mega-child friendly and also pretty quiet during the week in Edinburgh. I have had whole exhibitions to myself while the baby sleeps in the pram or even crawls on the floor beside me 🙂 There is also always caffeine nearby. I go a lot with my 3-year-old and she loves looking at the paintings and is now quite at ease in a gallery! The National Galleries Scotland run BYOB talks (Bring Your Own Bump!) “Monthly informal gallery chats for grown-ups with their wee-est ones.” Amazing! Languages – Of course, this is where my passion lies and I would encourage you to grasp this opportunity with both hands! Learning a new language has huge proven cognitive benefits. Brushing up on our existing level can seem daunting but believe me, it is not all that hard. At Mini French (or Mini Spanish coming next year) you can learn along with your child. The language coaches are trained to keep parents and children engaged and you will come home feeling brighter in every way! Socialise with purpose – Finally, as parents of young children, we ALL have days when we are overwhelmed and can barely function (in fact I am writing this in bed with a toddler next to me). On these days, meeting up with fellow parents who are all in the same boat is very important. There are social groups around the country. One very good one in Edinburgh is MumUnity. A supportive bunch of Mums run by Amber, the founder of Lottie’s Boutique. You will be met with no judgement and a cuppa. Your mental health is paramount. At Mini French, you will also meet lots of cool, like-minded parents. Our aim is for every parent to get a warm welcome and many stick around for a coffee after. So there you have it… which brain-boosting activity will you start this week? Children are kinaesthetic learners so singing and making together is a fab way to learn. He pops out his head! 2. Faites une fente à l’un des bouts à l’aide d’un cure-dents ou un couteau pour enfants. Split one of the ends with a toothpick or child friendly knife. 3. Modelez les antennes avec les doigts. Shape the tentacles with your fingers. 4. Mettez le marron dessus et pressez légèrement. Place the conker/ chestnut on top and firm down gently. 5. A l’aide d’un cure-dents, faites les yeux et la bouche! Use the toothpick to shape the eyes and the mouth. With supervision, all ages can get involved! Let’s start with counting in French. Below is a manageable home lesson plan to learn to count to 20 (or 10 if that is your child’s current counting level). Music is a very powerful learning medium. Here is a video from YouTube which I quite like… be warned it gets stuck in your head but that is the point! Shopping: Count the food as you place them in the trolley or at the checkout. This could lead on to learning fruit names. Download my fruit poster here. This is also something you can ask your care provider to get involved in. Most adults can manage to learn to count in a new language and will relish the challenge! My childminder was delighted to speak in French a little when she looked after my youngest. Bingo: Remember that it can be hard for young children to verbalise new words so asking to point at words is easier. Download my bingo printable. There are three levels: ‘Niveau 1 – Niveau 3′. So there you have it, adding some small activities into your busy day can be very effective in giving your child a headstart in a language. Positivity and encouragement are the main resources in your language teacher toolkit. This will boost your child’s confidence and have a snowball effect in their language learning. I see it happen ALL the time at class. Those parents who put in a tiny bit of effort at home through music or games will result in their children having a solid grasp of the foundations of a second language in their preschool years. Fancy another activity? Check out my Learning Through Taste home lesson! It has been a very busy few months! Mini French has been signing-up a record number of children to our programmes. We are obtaining consistently high re-sign up rates from families and have started working in many new nurseries who are all giving us great feedback. My teachers and I work hard to ensure that our programmes are highly engaging and very effective. We focus on babies to age 7 as I am passionate starting a language in the early years. It is a very specialised role to be able to entertain and engage this age group but sooooo rewarding! But how did Mini French begin? Watch the Story of Mini French to find out! For happy brains and bright futures, join Mini French! Let’s take a multi-sensory approach to learning when teaching a new language! You learn language through MEANINGFUL and DAILY interactions. That is how you learned your first language and that is how you will learn your second language. 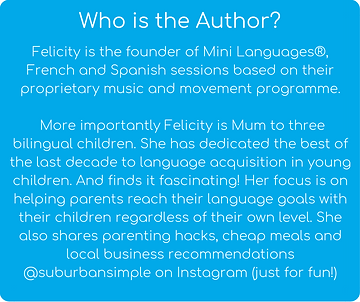 For any family dynamic, monolingual parents ‘teaching’ their baby a second language, bilingual parents striving to increase exposure to their home language or mixed heritage parents raising their child in a mixed language environment – quality and quantity is KEY! For babies and kids that means – fun, engaging natural interactions. So grab some fruit, sing ‘Pomme de Reinette’ to set the scene (check out YouTube or ask me!) and try out this fun idea to eat and learn at the same time. A winning combo! Check out this summer activities checklist with all the vocabulary you need for “Staycations & Vacations”! Get in touch via Facebook or email to let me know how you are getting on or for more tips! Up your French vocabulary at home with this cute poster! Keep it handy in the kitchen and say the words when youare cooking or eating. Leave me a comment if there are other themes you would like to see in this series?